It is a world of discord, where man fights man despite the looming darkness. Corporations zealously usurp each other and leave humanity an easy target of the Dark Legion. But one group stands up and waves the flag of unity among men. It is the last bastion capable of uniting the forces of mankind in full. These powerful men and women call themselves The Cartel. History: Immerse yourself in the history and origins of The Cartel. Discover the past that sets the foundation for success against the impossible present. 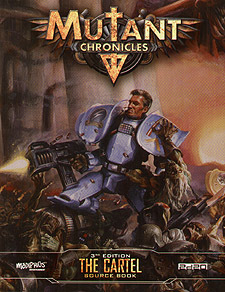 Freelancers: The freelancers walk the edge of the law, but without them The Society of Mutant Chronicles would not work. Learn some of the secrets to the success of the Freelancing Independent Corporations' Committee within the Cartel. Underbelly: Even The Cartel has its seamy underside. Power tends to corrupt, and absolute power corrupts absolutely. Behind the red tape, beneath the democratic votes and good intentions, something more nefarious moves about.